I have always been big. Born to immigrant Filipino parents, white rice was a staple of my diet growing up: most Filipinos will normally eat 3 cups of cooked white rice per meal or sometimes more depending on the food. When I was 8 years old, I heard the term “over weight” for the first time when my pediatrician used these words to describe my body type. During grade school, my weight made me an easy target for bullies as a punch line for their jokes. I still cringe every time I hear the theme song to the cartoon Fat Albert, as the bullies thought it was so clever to nickname me Fat Andrew. To try to help me lose weight and protect myself from bullying, my parents enrolled me in martial arts, but unbeknownst to my parents, my Filipino diet and large portions of white rice at home kept the weight on. Through the years, because of my affinity for sports and working out, I would lose weight, but after awhile gain it back. Filipino food, white rice and my sweet tooth always won in the end. During an annual checkup with my doctor, she told me that according to my blood test, I had pre-diabetes and high cholesterol; and if I did not make a change soon, that I would be placed on medications. My parents and grandparents were both Type II diabetics, so I am very familiar with what diabetes has done to my family and how it shortened their lives. Numerous members of my family were on a cocktail of medications for high blood pressure, diabetes, cholesterol, or a combination. I looked in the mirror that night and told myself that I did not want to end up taking pills for the rest of my life. When I signed up for the holiday challenge, I was already 9 months into my own personal transformation. By cutting down on sweets, fast and fried foods, and moderate exercise 3-4 times a week, I had already dropped 25 pounds from January to October of this year. I went from a couch potato to moderately active. However, my weight loss had begun to plateau, and I was not even close to my goal that I had envisioned. 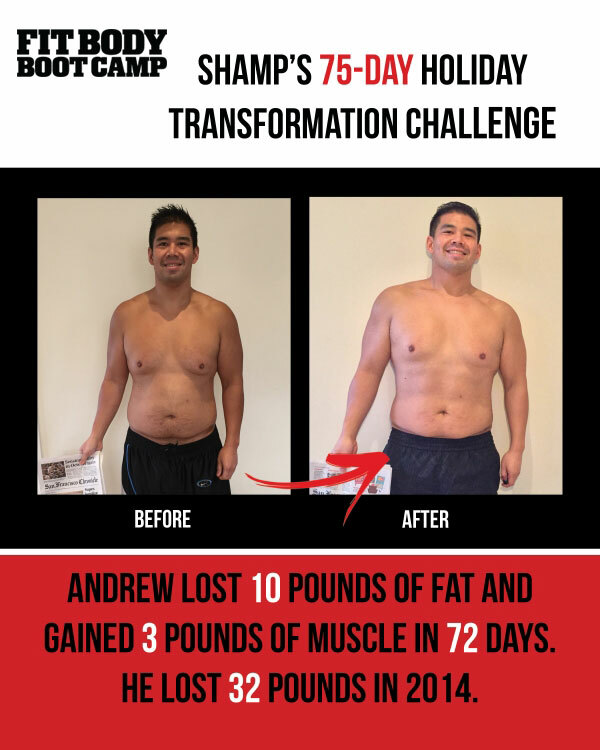 What this challenge signified for me was to take my transformation to the next level, go from average fitness to extraordinarily fit, to drop my body fat, increase my muscle mass and finally have the body to not be ashamed to take my shirt off at the pool. If I was going to take myself to the next level, I knew that my diet was the thing that I had to change the most. I researched several types of diets but in the end, I decided calculating my macro intake according to my body mass index (BMI) was the best route to take. I used the “myfitnesspal” app on my phone to track my macros and calories, but focused more on my macro intake of fats, carbohydrates and proteins. I substituted brown rice for white rice. I began to vary my carbohydrate sources: Sweet potatoes, squash, quinoa, and Ezekial bread. I drastically cut down my portion sizes (no more 3 scoops of rice per meal). I increased my protein intake to about 1 gram per pound of bodyweight (for me, 200 grams/day). I increased my vegetable intake to one to two servings per meal. I started adding vegetables like spinach, kale, or carrots to my blended protein shakes, which surprisingly did not taste as awful as I thought. I made it a goal to drink at least a gallon of water per day, which cut down my desire for diet sodas and sweets. Before I eat any meal, I would drink a glass of water. After the meal I would drink another. This made me more full after meals and could have smaller portion sizes as a result. I would eat three regular meals with “snacks” in between: usually a protein source with a healthy fat, yogurts, homemade nut butters, or Kind Bars or granola. Mentally, I could maintain smaller portion sizes throughout the day if I knew I was going to eat again soon. I brought all my food to work with me; I consumed nothing from work other than water. Going back to my martial arts background, my trainer Tonya allowed me to kick the heavy bags at Gold Medal, which opened up a new dimension of “extra credit” workouts and increased my flexibility. Overall, doing this challenge was a series of ups & downs both physically and mentally. I had several nagging injuries that kept me from working out or limited what exercises I could perform. I tried my best to not push my injuries too much, but it was definitely frustrating having to rest up when I wanted to work out. Concerning my eating, I initially started very well, dropping 5 pounds and 3% body fat within the first month. Once the holiday season began (beginning with Halloween), things became much harder. I was around temptation constantly: chocolates and candy for Halloween, then Thanksgiving with the endless devouring of food. As we come closer to Christmas, we are getting various gifts at my office of chocolates, cookies and other sweet treats. It because extremely difficult to eat healthy and maintain self-control from these tempting treats. Several times, I did fall off the wagon and just indulged myself, and my weigh-ins and mental state fluctuated back & forth. I always tried to remember that one failure does not ruin my entire challenge, nor does it discredit all the hard work I had done thus far. No one is perfect, if you fail one day, you pick yourself up and go back at it the next day more determined and hungrier (mentally, not physically). I think just realizing that fact has strengthened my resolve, and is probably the biggest thing i have learned from this challenge. Even though the challenge has ended, it does not mean that my goal is complete, not even close. The result that I truly desire cannot happen overnight or over the course of 75 days, but rather years. After years of diets, shakes and pills, I realize now that a lifestyle change is what I needed to have to really lose weight and become healthy. My biggest reason to continue this healthy lifestyle change: I now have two little girls, ages 5 and 2. I am going to lose this weight for them, I want to watch them grow, and to be able to walk my girls down the aisle on their wedding day.